In troubleshooting heat pumps which are not working properly, it is important to know the main components that make up the equipment. The electrical and electronic parts that control the equipment are the power supply, wires and printed circuit boards. The mechanical parts are the evaporator, condenser, compressor, metering device and the 4-way valve. In the USA, usually when the 4-way valve is ON, the system is operating in the cooling mode. When it is OFF, it is operating in heating mode. In some other countries, when the 4-way valve is ON, the system is operating in the heating mode and vice-versa. A 4-way valve in a heat pump system. 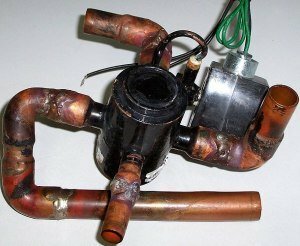 In this article, we will assume that when the 4-way valve is ON, the system is operating in cooling mode. Here are some common problems and the solutions that you may want to check if your heat pump is not working. Depending on your knowledge and experiences in troubleshooting heat pumps, it is good to find out what is wrong with your equipment even though you may have to call the technicians to solve the problems. Take note that the problems listed below are specific to a certain case and the solutions may differ from your units. Troubleshooting Heat Pumps Problem #1: During summer, when I run the heat pump in cooling mode, no cool air is discharged but instead hot air is discharged. The problem is that the 4-way valve is not switching ON as the relay controlling the valve is not working. Solution: The 4-way valve is activated by a 24V DC relay SPST contact. The coil of the relay is connected to a 24V DC power supply and is activated by a microcomputer through a transistor when it is in cooling mode. 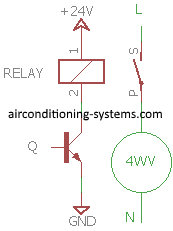 When the relay is activated, the SPST(single pole single throw) contact will close and caused the 4-way valve to be activated causing the heat pump to run in cooling mode. OFF the mains supply to the control board and check the coil resistance of the relay by using a multi-meter. It is found to be open circuit instead of resistance of 15-25 ohm. This confirms that the coil of the relay is faulty hence the contact is not able to switch the 4-way valve to ON. This is the reason why it remains running in heat mode. After the relay had been changed, the cooling mode works fine. Troubleshooting Heat Pumps Problem #2: My heat pump system is unable to start and all the LEDs on the indoor unit are OFF. A severe lightning and thunderstorm occurred the night before. Some electronic components have been damaged due the the surge in voltage on the printed circuit board. Solution: The technician used the multi-meter to check the voltage to the transformer. It was found that there was no power supply to it. The power supply was available before the fuse. The mains was then OFF and the technician checked the fuse for continuity. It was open circuit, confirming that the fuse had been blown. A section of the circuit that shows the fuse, varistor and transformer. The transformer was also checked and found to have a resistance of 15-20 ohm which indicated that it had not been damaged. The surge protection device known as varistor was checked and it was found to have low resistance (<10 ohm) confirming that it had been damaged. The element in the fuse open circuited after that. Only these two devices were damaged. The other components had been protected through the actions of these two components. Both components were changed and the unit is operating again. Troubleshooting Heat Pumps Problem #3: During winter, I use the split heat pump in heat mode but after some hours of operation, the outdoor unit becomes a block of ice. There is a control board in the indoor unit and a defrost controller in the outdoor unit. The problem is that the defrost thermostat contacts are not closing to operate the unit in defrost mode. Solution: In normal operation, when the time and temperature conditions to go into defrosting mode have been achieved, the defroster thermostat will close the contact of the reversing valve and open the contact to the outdoor fan. This will force the unit to go into defrosting mode where heat from the inside of the building will be used to heat up the frost/ice on the outdoor unit. During this time, the outdoor fan will be OFF. This will cause the frost to be removed. After that, the defroster will go back into normal heating mode. The outdoor unit freezes up because the defroster contacts are not able to close due to the faulty component hence the unit unable to go into defrosting mode. The defroster has to be changed for it to operate properly again. See also other typical HVAC questions and answers.